Encinitas CA— The Yellow Boat is a beautiful retelling of a child’s life, based on the true story of the playwright’s son, Benjamin Saar, who was born with congenital hemophilia and contracted the AIDS-virus from the blood factor meant to save his life. His world is split in half – one, a sterile, bland hospital, and the other, a colorful world straight out of Benjamin’s (Caeden Schlosser) mind. With the help of the eccentric Child Life Specialist, Joy (Gage Tanzman), and a chorus of characters (Keaton Boddicker, Rachel Kaplan, Madison Noyes, Colin Gasperoni) that build the world around them, Benjamin and his parents (Riley Switzler, Clara Conkling) take a remarkable voyage exploring Benjamin’s life and learning to cope with these life-threatening complications. An incredible, heart touching story, The Yellow Boat makes for San Dieguito High School Academy’s eighth annual Theatre for a Cause production. All donations and proceeds earned will go to Conner’s Cause for Children. Like so many other organizations in our community, Conner’s Cause for Children began in Encinitas in 1994 when concerned friends and neighbors of the family of four-year-old Conner Champ put their collective heads together to find ways to provide financial support to his devastated family during Conner’s year-long losing battle with brain cancer. In the over two decades since his passing, Conner’s Cause for Children has honored the legacy of this brave little boy by helping thousands of other families like his deal with the unimaginable emotional and financial burden of caring for a critically ill child with a life-threatening illness or injury. The mission of Conner’s Cause for Children is to ease the financial burden for families of children with life-threatening illnesses or injuries, regardless of specific diagnosis. The sole focus of Conner’s Cause is to ensure no child goes without access to the medical treatment and an appropriate home care environment because of a family’s lack of money. Proceeds from The Yellow Boat will go to families in need. 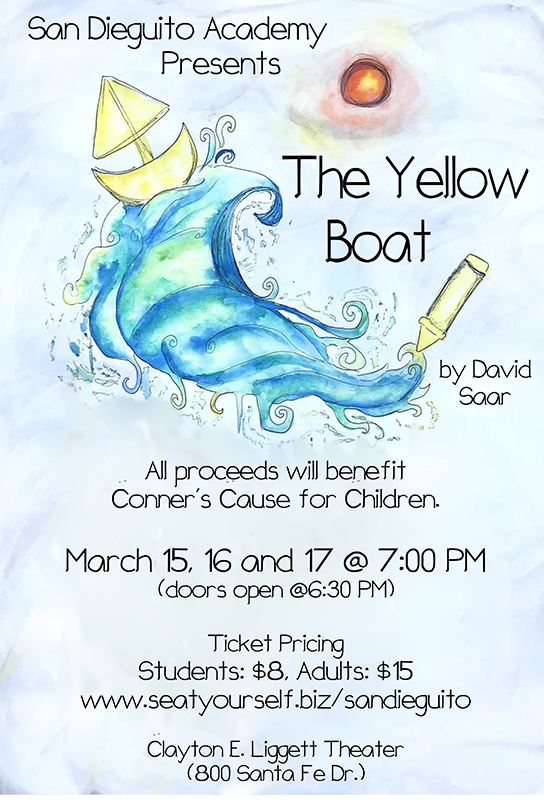 San Dieguito High School Academy will present The Yellow Boat on March 15th, 16th, and 17th at 7:00pm San Dieguito Academy’s Clayton E. Liggett Theater on the San Dieguito Academy Campus, 800 Santa Fe Drive, Encinitas. Tickets cost $15.00 for adults and $8.00 for students and children. They are available for purchase at the door or at www.seatyourself.biz/sandieguito.